Irshaalgad is a fort situated in the Karjat Region. Other forts in this region include Prabalgad and Malanggad. While driving along the Mumbai Pune highway, the forts of Malanggad, Devni Pinnacle, Matheran, Peb, Mhasmal, Prabalgad, Irshal attract one�s attention. The population in this area is quite normal. Because of the very heavy rainfall in this region, the most cultivated crop is rice. As the fort is very near to the highway, the approach road to the base village is available. The name Irshaalgad itself is a misnomer; Irshal is not a fort but actually a pinnacle. This is the reason why it hardly figures anywhere in history. Shivaji Maharaj captured the complete region of Kalyan and Bhiwandi, up to Rairi in May 1666. This fort too, must have come under the Maratha rule at that time. Irshal is the next-door neighbour to Prabalgad. A sad incident occurred on this pinnacle on January 23, 1972. Kumar Prakash Durve lost his life after falling down from this pinnacle on that day. 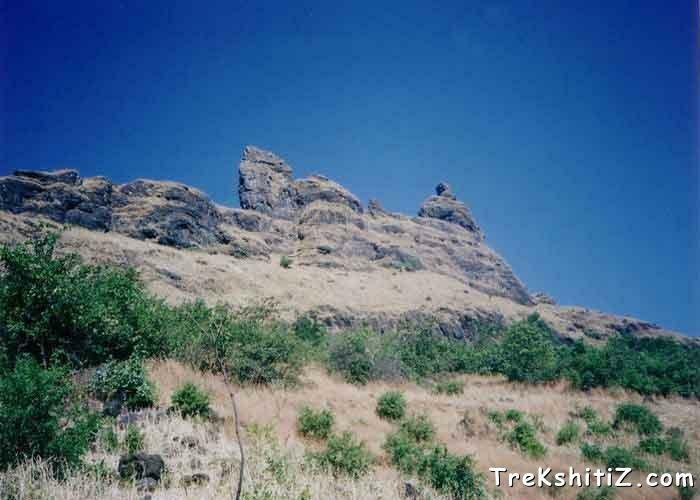 To remember this day, all the trekkers from the Mumbai � Thane region assemble here on January 26 every year. As mentioned above, Irshal is a pinnacle. There is a water tank on the route from the Irshal plateau to the peak. From there, we reach the needle hole near the top through a simple rock-climbing route. Proceeding little ahead, we see a water tank to the left and a cave to the right. This water is suitable for drinking. The route, which climbs up from near the needle hole goes to the top of the pinnacle. To reach the top of the pinnacle, it is essential to have artificial rock climbing equipment. From the top we can see the forts of Prabalgad, Matheran, Chanderi, Malanggad, Karnala and Manikgad. Food can be arranged for a maximum of 5-6 people at Irshaalwadi. The water in the tanks last only up to March after which there is no water available on the area. It is extremely difficult. To reach the top of the pinnacle, technical rock climbing expertise is necessary. It is essential to have a 100 feet rope and other rock climbing equipment.